The All American Forward Engine (FE) school bus extends Blue Bird’s legacy of leadership by setting new industry standards for driver ergonomics and productivity, safety, serviceability, passenger comfort, and life-cycle value. 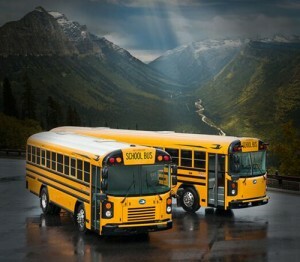 From its larger, bonded-for-strength windshield to its recessed LED rear lighting, its new features rest on our time-honored foundation of school-bus-specific design, superior materials, and cut-no-corners construction. Thanks to its unequaled, better-than-ever maneuverability, coupled with a flexible array of body plans and seating configurations accommodating from 54-90 students, the All American FE is an ideal transportation solution, especially in densely populated areas and along highly-trafficked and/or tight and windy routes. The All American Rear Engine (RE) school bus extends Blue Bird’s legacy of leadership by setting new industry standards for driver ergonomics and productivity, safety, serviceability, passenger comfort, and life-cycle value. From its bonded-for-strength windshield to its recessed LED rear lighting, its new features rest on our time-honored foundation of school-bus-specific design, superior materials, and cut-no-corners construction. The engine’s rear location provides exceptional serviceability, allows extra cooling and consequently higher power ratings, reduces noise to lessen interference with the driver, and allows an unencumbered stepwell for boarding ease and a clear view of children boarding and exiting. With capacities ranging from 66-90 students and attractive fuel choices of diesel or compressed natural gas, the All American RE is an ideal transportation solution, especially on routes requiring extra power.